Cinder is a once-in-a-lifetime dog. She is not only sweet and kind, she always tries her hardest no matter what I ask her to do. And she is quite the character: she loves doing “upside-down dog” in my lap before an agility run. No stress bunny here! 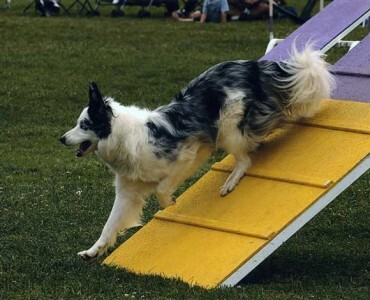 In agility, she is extremely honest, fast and a great partner. On stock, she is very talented: wide-running, balanced and biddable. She easily makes the transition from cattle to sheep to ducks (although sheep are still her favorite!) They don’t make dogs like this very often and I feel extremely fortunate that Cinder is a part of my life. 2006 1st Place WVDS USDAA 22″ Steeplechase!